What is The One-Handed Cook? 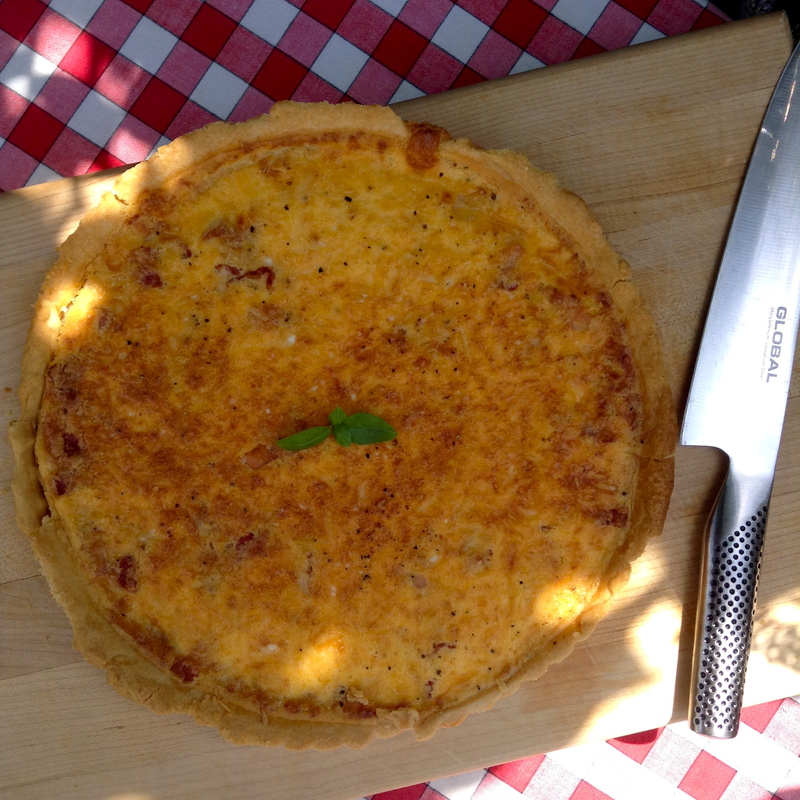 Small patio aside, I did recently make and enjoy a rather fabulous Quiche Lorraine, inspired by some rather lovely Clarence Court Burford Brown eggs and Spoiltpig bacon, which I was sent to taste. I have written about Spoiltpig bacon before, and the reason I like it is because it’s made using outdoor reared pork approved by Freedom Food AND it’s completely delicious. Animal welfare is important to me and I would rather buy less meat than buy low-quality meat of questionable origin. Burford Brown eggs have the most wonderful deep sunset yellow yolks and will give your quiche a super colour, and again are free range and produced with high welfare standards in mind. 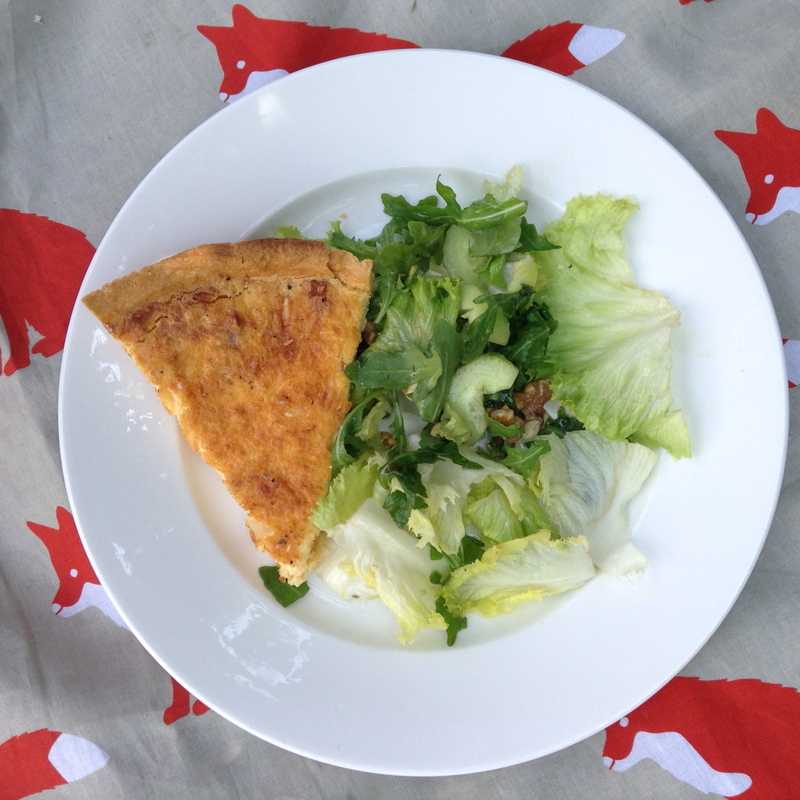 Now trust me, this Quiche Lorraine is seriously good. I am afraid that this isn’t a recipe to be made one-handed, but what is brilliant is that you can make it in stages – you can get your pastry base ready and leave it in the fridge until you are ready to bake it, you can cook the bacon in advance – it doesn’t matter if it goes cold once it’s cooked as it goes back in the oven anyway. Get the different elements ready and then whip up the filling and assemble the thing when you have time. You will be pleased you did, as it’s pretty impressive! We all absolutely loved this and I have made it twice during the last two weeks, so this is a must-have summer recipe as far as I am concerned. Oh, and I used bought pastry. I’m a busy woman!! A classic Quiche Lorraine does not have cheese in, I’m told. But I always add it. Coz I am crazy like that. This is delicious warm from the oven (allow it to cool a little before serving) or at room temperature the next day – remove from the fridge half an hour or so before serving. Great with a crunchy green salad with a vinaigrette dressing or, for the kids, slices of cucumber and mini tomatoes. Trim the pastry edges so it sits slightly above the tin. Prick the base with a fork and chill for at least 10 minutes (the quiche, not you). When ready to cook, put a baking sheet in the oven and heat oven to 200°C/180°Fan/Gas 6. Line the pastry case with cling film and fill with dry or baking beans and bake on the hot sheet for 15–20 minutes. Remove cling fim and beans and bake for another 5 minutes until the pastry is golden. Heat the oil in a frying pan and cook the bacon for around 8–10 minutes, until cooked through but not crisp. Drain and spread half over the hot pastry base. Put the cream and the eggs and yolks into a large bowl with a generous grinding of black pepper, and beat together slowly until combined. Add the grated cheese, and then give it a fast whisk for 30 seconds until frothy. Pour over the bacon, and then sprinkle the remaining bacon on top. Bake for 20 mins, then check. The quiche is ready when it has puffed up but still has a wobble in the centre. Allow to cool slightly before serving. I was lucky enough to be sent Denhay Farms’ Ultimate Breakfast Box to try out on the family, which included their award-winning bacon, spoiltpig sausages, Clarence Court’s Burford Brown eggs, Tracklements tomato sauce and smoked chipotle salsa. Nice. I am a big believer in breakfast, but like most busy mums, don’t always have time during the week to make a real effort with breakfast. I usually have plain yogurt with some sort of granola (Rude Health is a favourite) and the children have cereal or porridge, fruit and sometimes bagels or rice cakes with peanut butter. However at the weekend we usually have scrambled eggs, porridge, fruit salad, American-style pancakes and sometimes a cooked breakfast, which is a real treat. We had never tried Denhay bacon, and I have to say, it was absolutely delicious. I was very pleased to see that both it and the sausages have the Freedom Food label – something which is important to me. The sausages had a lovely flavour, and I was really quite taken with the ketchup (although, you guessed it, the kids prefer ‘the normal one’) but the eggs stole the show – I have never seen such gorgeous vibrant yolks before (if you’re into Pantones, think Spectra Yellow). Which inspired me to make scrambled eggs – one of the few dishes that really can be made one-handed – assuming you can crack an egg one-handed! Scrambled eggs are great for older babies (make sure they are cooked through), toddlers, big kids, and even bigger kids. Eggs pack a great protein punch, plus the yolks are high in lecithin, which helps memory and concentration – so they’re an important brain food. They really are the perfect breakfast food, and what’s more, you could add some spinach for an iron kick. A great healthy start to the day for the family! Keeping the heat fairly LOW is the key to good scrambled eggs; it may take a wee bit longer, but you will be rewarded with delicious, creamy eggs that taste sooo good. Disclaimer: I was sent the Ultimate Breakfast Box as a gift. All the views here are my own. Top Five Tips for a Successful Christmas Day! And What Will She Have? Ideas, useful kitchen gadgets, recipes and more for busy people!